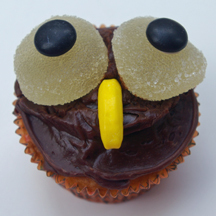 This big-eyed owl cupcakes are a hoot (sorry!) on Halloween or anytime. What You Need: 1 cupcake; chocolate frosting; 2 white fruit gels; 2 brown or black M&Ms; 1 banana candy (such as Runts). How to Make It: Frost cupcake. Arrange gels side-by-side. Use dab of icing to attach one M&M to each gel. Stick banana nose in center. No, not cupcakes made with chicken. 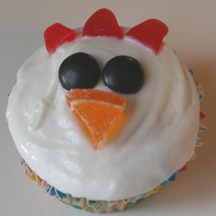 A cupcake of a chicken. Enjoy them at a farm-themed party or anytime. What You Need: 1 cupcake; white frosting; 2 red Swedish fish; 2 black (or brown, or blue) M&Ms; candied orange slice; kitchen shears or knife. How to Make It: Frost cupcake. Cut tails and heads off Swedish fish (it won’t hurt them). Stick head into frosting at center top of head and put the tails, which are smaller, on either side. Cut triangle shape from orange candy for beak and place near center of cupcake. Place M&Ms, upside down, directly above beak. 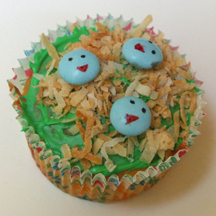 Add some texture to your baby chick cupcakes this Easter with shredded coconut! 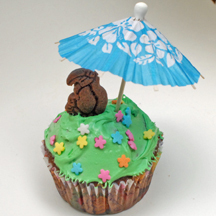 These cupcakes would also be fun at a party with a farm theme. What You Need: 1 cupcake; frosting tinted yellow; shredded coconut; yellow dye (liquid or paste); orange candy fruit wedge; 2 brown, black or blue M&Ms; 3 red jellybeans; scissors or knife. How to Make It: Frost cupcake. Put coconut in a bowl, add yellow dye and mix well. 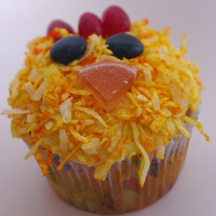 Sprinkle on cupcake for feathers. Arrange 3 red jellybeans at top of head. Cut triangle shape from candy fruit and place on top as beak. Add M&M eyes. What You Need: 1cupcake; tan frosting (tint white with chocolate, or chocolate with white); large twist pretzel; 2 green Runts candies or M&Ms; almond slices; candy corn. How to Make It: Frost cupcake. 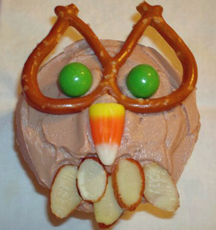 Break off part of pretzel as shown and place near top edge of cupcake. Place green candies inside pretzel “glasses” for eyes. Add candy corn nose. Arrange almond slices near bottom edge for feathers.